He was there the day we rolled into town, a mere 13 months ago. Back then he was a bit brawny, suntanned, with short brown hair. He looked like he might have been a cub scout once. I don’t know his real name. I just call him the Yorba boy because of where he lives. His name is also a code to my boyfriend to let him know I’m near home. I text “near yor boy” and James knows to open the garage door for me because I’m two minutes away. We’ve got a system and it works well. Over the months I notice his look evolve. All summer, that first summer, he wore a blue t-shirt, the same blue t-shirt. It got looser and darker as the summer passed by. His skin grew more leathery. Most days, after that summer, he started wearing a baseball cap. His look morphed. Through the autumn and winter he was a familiar sight. Sitting on a milk crate, cardboard sign in hand. Waving at cars as they pulled off the highway to get into Mexicantown. We used to joke that it was a good panhandling technique, to wave like that. Back then most of the trucks that carried goods back and forth across the Ambassador Bridge had to haul through this intersection. Last stop until Canada. It’s a way to get rid of American money before border crossing. Sometime in the winter, the International Bridge Company rerouted trucks to another exit. Every now and again you’ll get a lost trucker through the intersection, but it’s not the same. The Yorba boy’s blue t-shirt disappeared, replaced by a brown one that he’ll wear for the next six months. His hair, now seen only under a baseball cap, got long and scraggly, and he grew a beard. His once average build body positively lanky and one week he had a cast on his arm. Perhaps he got into a fight. Or maybe he fell, his bones brittle from the drugs he took. Don’t come to the intersection of W. Vernor and I-75 expecting to see a Yorba boy between the hours of 10 a.m. and 2 p.m. During that time he takes his earnings and walks to the corner stores in my neighborhood. Maybe he’ll buy a grape soda at the one in Mexican Village, but sometimes he goes to Shaun’s. Or, he’ll go home to the Hotel Yorba for a nap. Or maybe that’s when he’s scoring his drugs. The ones when paired with poverty, exposure and truck fumes are making him skinny and weathered. A man who has aged more than a decade in a year. These days I avoid that intersection. I have rerouted myself. Changed some habits, got a new routine. The Yorba boy still conducts trade there, looking more like Brad Pitt in Kalifornia every day. The folks living in the Hotel Yorba walk by my house every day, morning and night. Not long after moving here, we learned that the Department of Corrections used to drop returning citizens at the corner of W. Lafayette and Clark, just a block away. There’s a big parking lot in front of the Yorba, but it’s hardly ever full. Summertime when it’s extra hot, all its residents come out with their chairs and sit under trees that canopy the parking lot, hoping for some shade and respite. I don’t like living so close to the Hotel Yorba but the folks there don’t really bother me either. I can tell the place used to be spiffy; a nice stop either before or after bridge crossing in the twenties and thirties. Before Detroit’s decline. 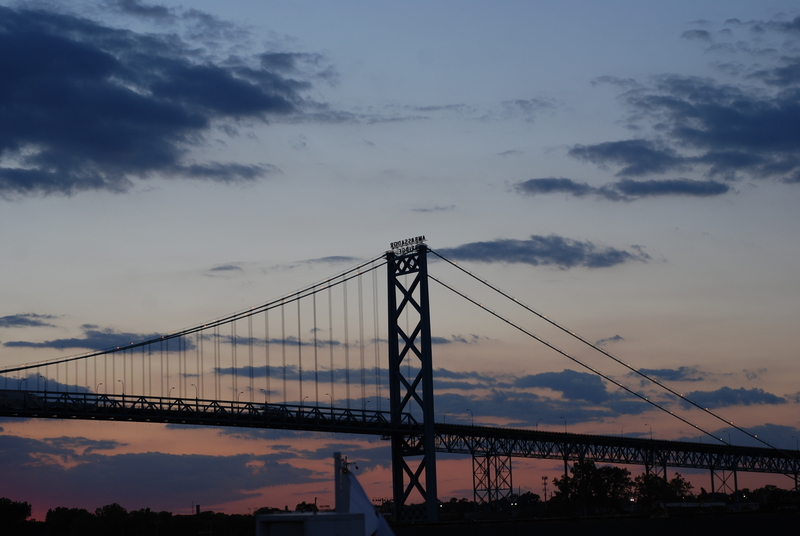 The Ambassador Bridge, visible from our front yard, aging and blue with twinkling red letters spelling its name, punctuates southwest Detroit from the industrial Westside. Like an incomplete parenthesis, the bridge sets us aside and leaves us hanging. Even though it’s owned by one man – why should one man own a bridge between two countries – and deeply out of date, something like one quarter of Canadian-U.S. truck commerce crosses the bridge daily. I look at the trucks passing each other over there on the bridge and am seeing one billion dollars of goods passing overhead each day. Detroit is breathtakingly rich and heartbreakingly poor, just like any city. In this city, it’s more commonplace to see both ends of the spectrum juxtaposed together almost tauntingly. I, as one of the very few skating the middle ground, realize how tenuous all of our positions are. One day I fully expect the Yorba boy to disappear for good. His lifespan cut short by the fateful path he’s chosen. And also one day the trucks will cross over the new international bridge, slightly downriver. This new bridge will be paid for by Canada and run by both countries. The billionaire with the bridge who has already spent tens of millions to stay the king of international crossings, likely has a game plan to keep the truck flow coming. In any case, I suspect the corner of W. Vernor and I-75 will have a new Yorba boy. But I hope not. Tags: Ambassador Bridge, Detroit, Hotel Yorba, Mexicantown, Windsor. Bookmark the permalink.